The best nature has to offer, formulated to address the issues of dry and mature skin. Our new Botanical Facial Moisturizer is luxurious, smooth and silky, and absorbs readily into skin with no oily after-feel. Leaves skin feeling smooth, supple and hydrated with a healthy radiant look. Perfect for day or night treatment, worn under makeup or alone. Ideal over one of our Botanical Facial Oil Treatments. Resveratrol (Japanese Knotweed grape skin extract) is one of the latest powerhouse extracts brought to us by nature. An anti-oxidant that is unparalleled in protection from free radical damage to the skin, with an estimated 17 times more activity than synthetic and natural forms of CoQ10. Hyaluronic Acid is one of the most effective moisturizing agents ever discovered, helping to preserve the principal characteristics of young, healthy skin, such as smoothness, elasticity and tone. 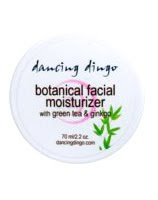 It works not only as a moisturizer, but also seems to speed the rejuvenation of damaged skin cells. There are very few ingredients that hold as much promise as Hyaluronic acid.